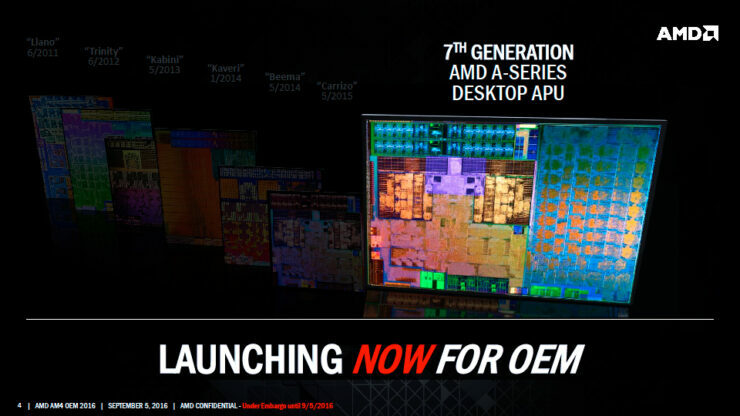 AMD has officially launched their 7th generation, Bristol Ridge APUs for desktop platforms. The latest APUs will be available for sale through several OEM manufacturers. The new series would utilize the Excavator and GCN core architecture to deliver increased performance on the same process node. 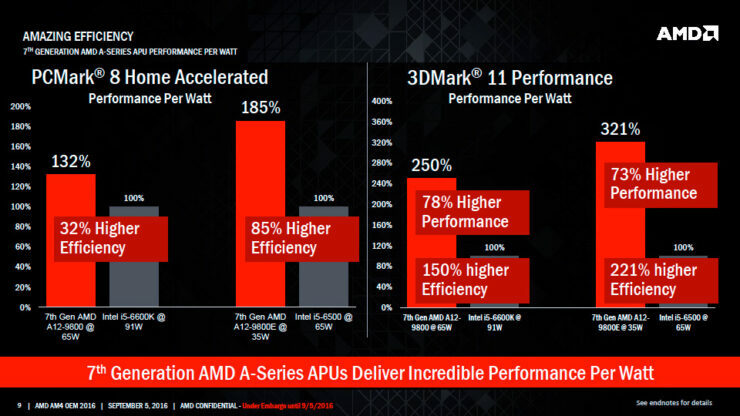 AMD has done some fine tuning with their latest processors and that should be visible on Bristol Ridge processors. 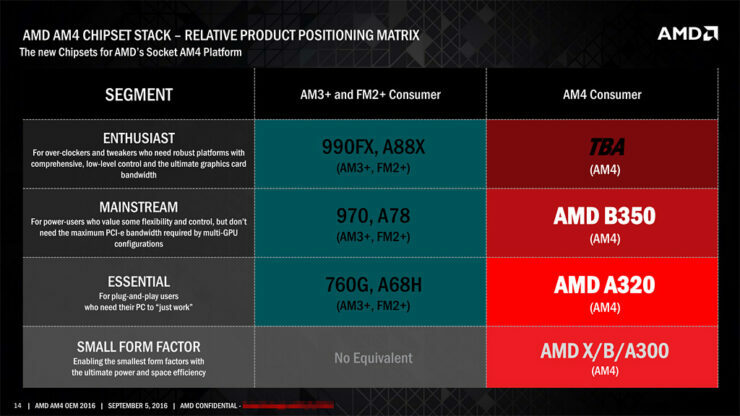 AMD has launched a total of 8 new Bristol Ridge processors for the AM4 platform. These comprise of A-Series and Athlon branded SKUs. 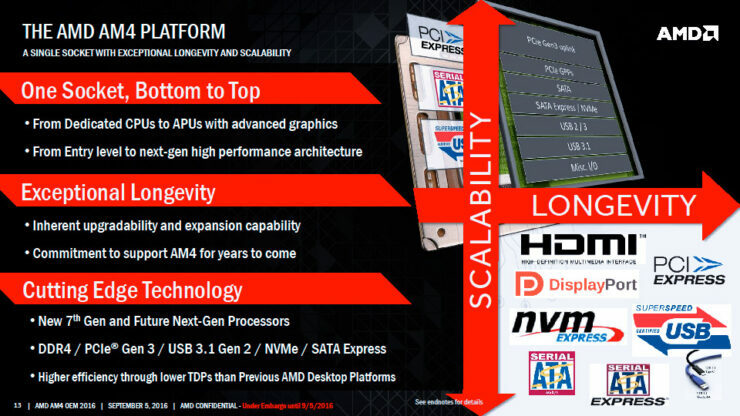 AMD had already launched Bristol Ridge for notebooks but are now bringing it to the masses on desktop platforms. AMD has chosen OEMs to ship their AM4 platform to the mass market. 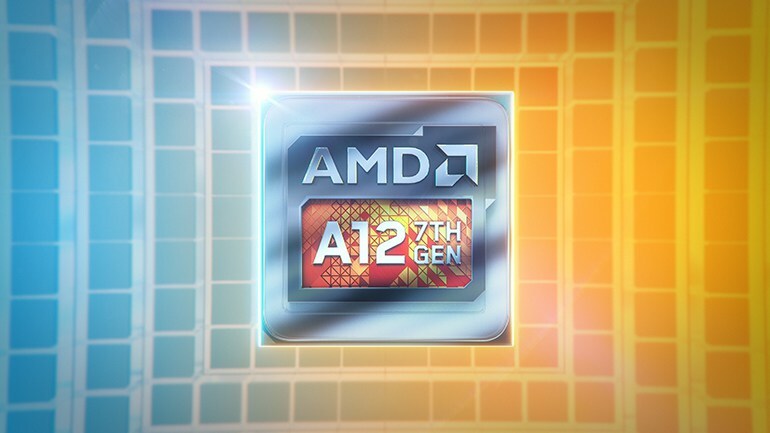 The DIY market would get a taste of AM4 a bit later when Zen is closer to launch. 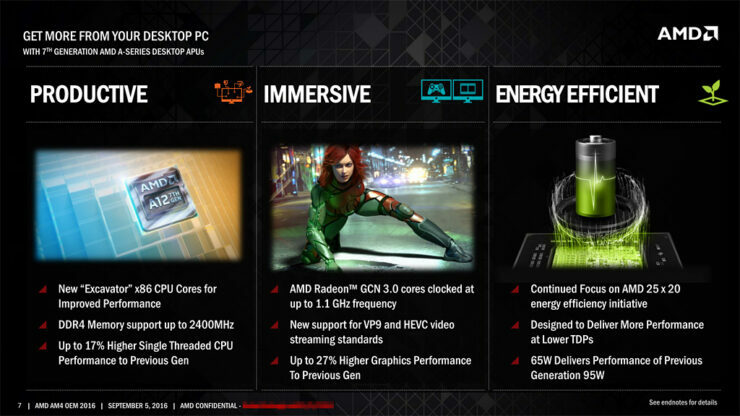 Till then, those interested in AM4 PCs can grab a ready-to-use PC from a local PC OEM. “The consumer release of these new HP and Lenovo designs is an important milestone for AMD on two fronts. 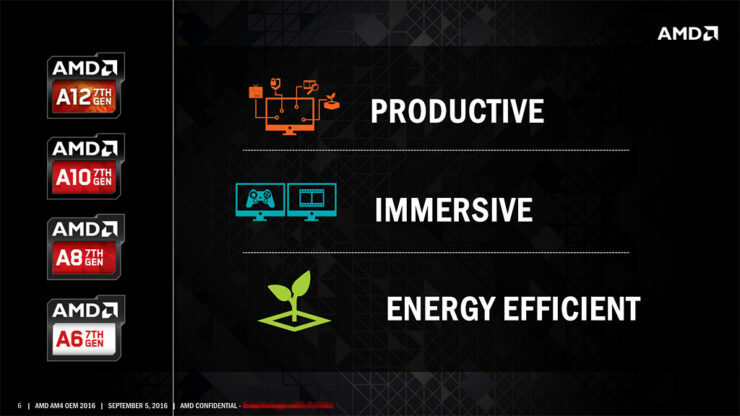 First, it marks a major increase in productivity performance, streaming video and eSports gaming experiences sought after by today’s consumers, delivered through our new 7th Generation AMD A-Series desktop processors. Second, because these new OEM designs also feature our new AM4 desktop platform, the motherboard ecosystem shows its readiness for our upcoming high-performance “Summit Ridge” desktop CPUs featuring “Zen” cores, which share the same platform,” said Kevin Lensing, Corporate VP and general manager of Client Computing at AMD. Some features of Bristol Ridge include up to four x86 Excavator cores with 2 MB of shared L2 cache. They will have support for HSA compute acceleration and the latest DDR4 memory standard. The Excavator core ensures better IPC (Instruction per clock) versus previous generation cores. 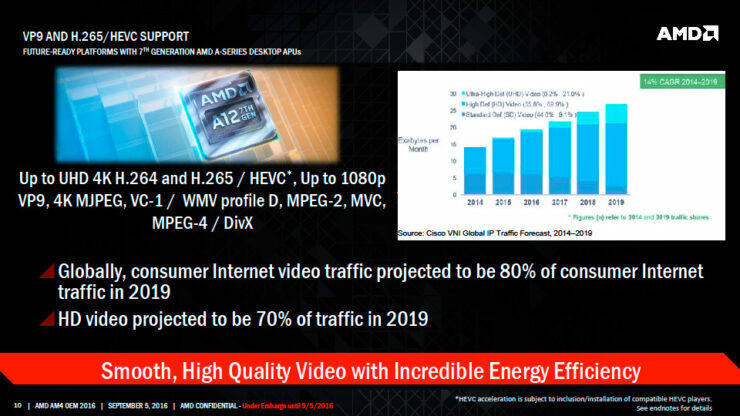 AMD Bristol Ridge A-Series APUs also come with built-in, high throughput media accelerators for HEVC (4K H.264 & H.265) support. The more beefy details are about the AM4 platform itself so let’s get into those. AM4 is a big deal for team red and they are going all in with feature support. 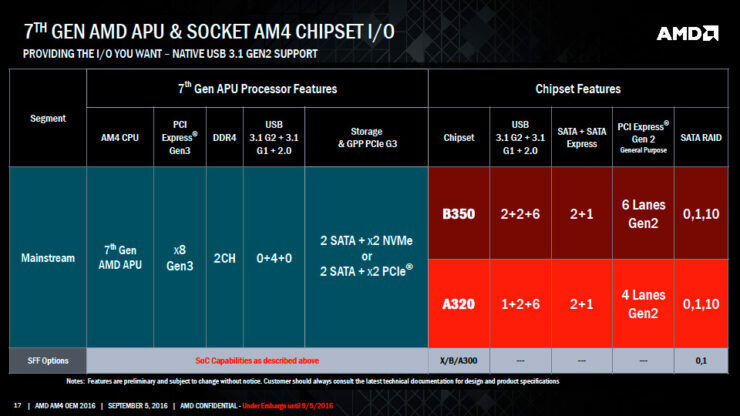 First up is the fact that AM4 will be a unified socket for both CPUs and APUs. It will support both Zen based processors and Excavator based APUs. This means that it will be able to support the entire stack of processors ranging from entry level, all the way up to the enthusiast stuff offering users more longevity and future upgrade support. 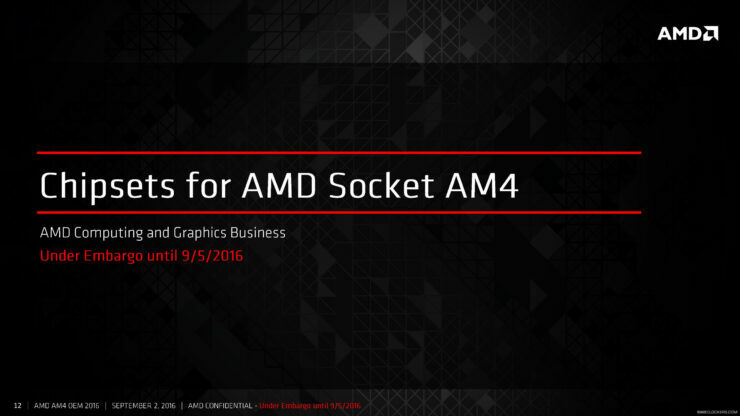 AMD plans to support AM4 for many years so that’s a plus point. Some general features of the AM4 platform is that it offers new I/O capabilities. We are looking at faster DDR4-2400 MHz memory, PCI-e Gen 3.0, USB 3.1 Gen 2, NVMe and SATA Express support. 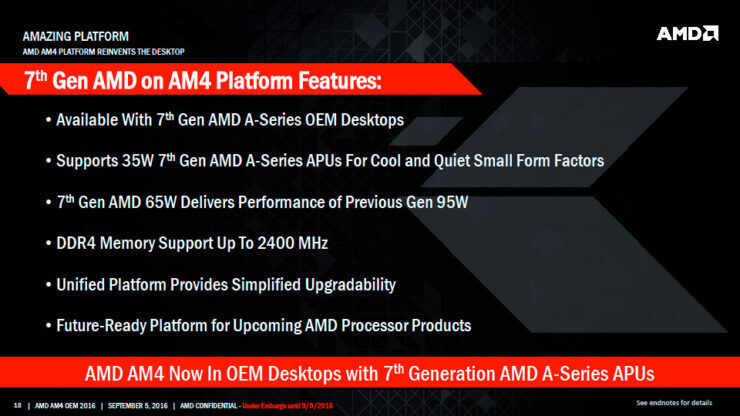 These features have been missing on AMD platforms for a while but it’s nice that AMD is finally making a proper comeback with modern feature support. Next up, we will be looking at four chipsets on AM4 motherboards. These are part of the Promontory chipset stack which is the codename for all chipsets used on AM4 boards. The two chipsets available today are B350 (Mainstream) and A320 (Essential). There’s also the A300 for small form factor PCs and a “TBA” chip for high-end, enthusiast processors that will launch later. The Bristol Ridge APUs feature 8 Gen 3 PCI-e lanes, dual channel DDR4 support, 4 USB 3.1 channels and 2 SATA + 2 NVMe or 2 PCI-e expansion support. Aside from that, B350 features higher PCI-e Gen 2.0 lanes and more USB 3.1/3.0/2.0 ports compared to A320. 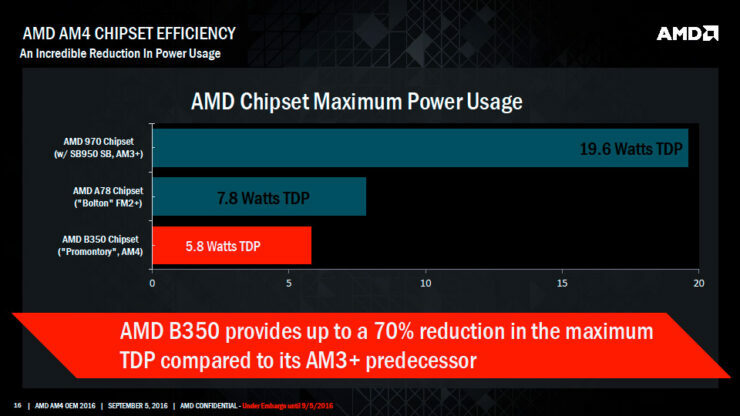 The AMD B350 chipset features 70% power reduction over its AM3+ predecessor (5.8W vs 19.6W). 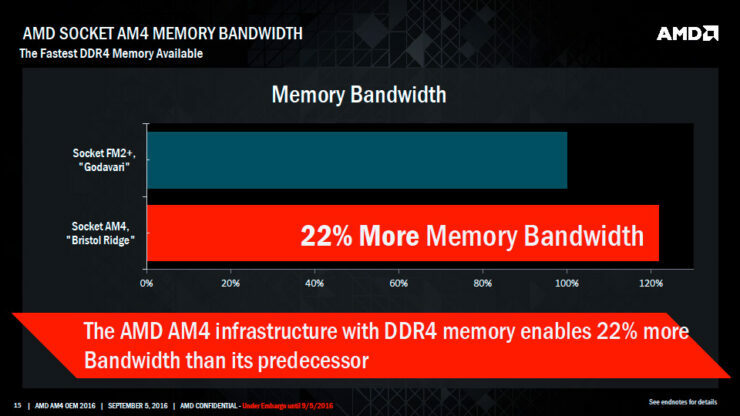 The latest DDR4 memory controller also offers 22% more bandwidth compared to DDR3. The A12-9800 is leading the pack of the Bristol Ridge lineup with a boost clock of up to 4.2 GHz. It also comes with the latest GCN core architecture with 512 stream processors running at 1108 MHz. The chip comes with 65W TDP. Rest of the variants comprise of regular and “E” variants which are tuned to offer lower power of 35W. 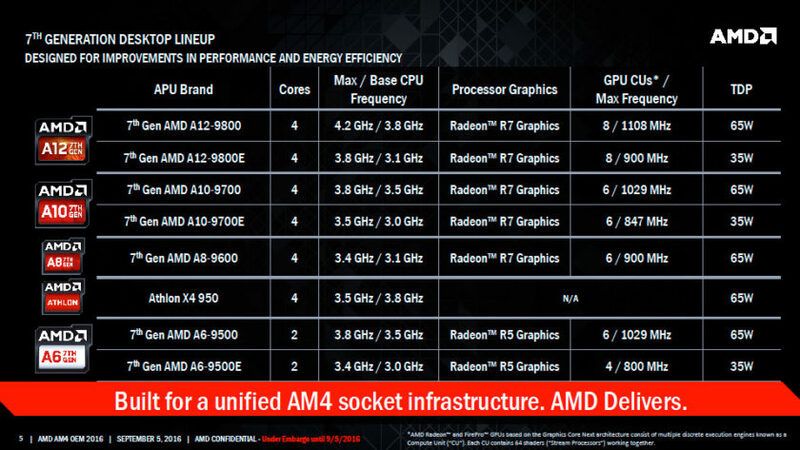 AMD also provided some internal benchmarks and comparison of their new processors against Intel’s Core i5 solution. 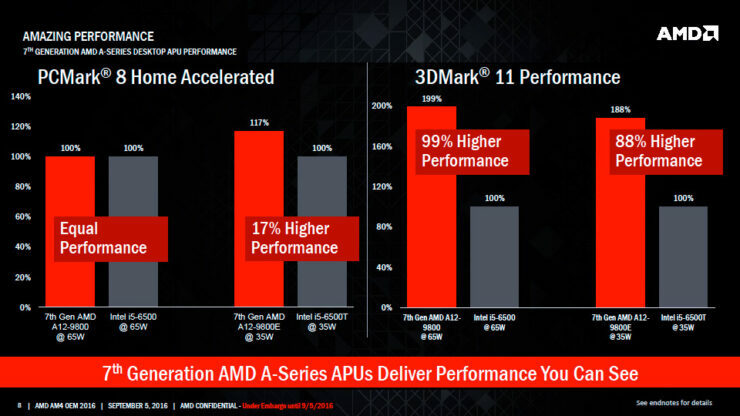 In PCMark 8 and 3DMark 11, the AMD A12-9800 performed well against a Skylake Core i5 CPU. Both performance tests and performance per watt tests turned out really good. The Bristol Ridge lineup is looking great but I guess most enthusiasts will be waiting to upgrade to the high-end stuff when Zen comes early next year.